38mm black ceramic case, black dial, automatic winding movement, black ceramic bracelet. 38mm black ceramic case,stainless steel bezel with set with white diamonds, black dial, automatic winding movement, black ceramic bracelet. 38mm black ceramic case,stainless steel bezel with set with white diamonds, black dial, automatic winding movement, black ceramic bracelet set with diamonds. 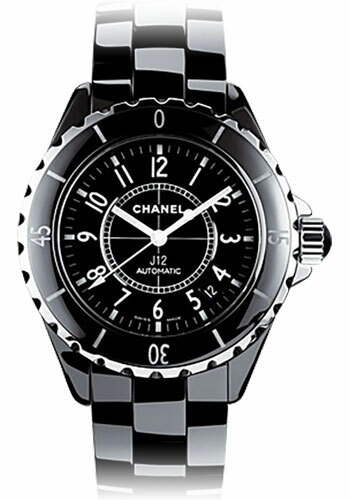 38mm black ceramic case, black dial with white diamond hour markers, automatic winding movement, black ceramic bracelet. 38mm black ceramic case,stainless steel bezel with set with white diamonds, black dial with pave diamond center, automatic winding movement, black ceramic bracelet. 38mm black ceramic case, black dial with pave diamond center and diamond hour markers, automatic winding movement, black ceramic bracelet. 38mm black ceramic case, 11.40mm thick, solid back, screw-down crown, 18K white gold bezel set with 36 baguette cut F-G color, VSS1 quality diamonds & 12 black baguette diamonds, highly scratch-resistant crystal, black lacquered dial with 12 applied diamond hour markers, automatic movement with hours, minutes, seconds, date window located between the 4 & 5 o'clock position, black strap, ceramic bracelet. Water resistant to 200 meters. 38mm 18K pink gold and black high-tech ceramic case, screw-down crown, 18K pink gold bezel set with 46 baguette-cut diamonds (~ 4.4 carats), highly scratch-resistant crystal, black dial with 8 diamond indicators, self-winding movement with hours, minutes, seconds, date, approximately 42 hours of power reserve, black strap, ceramic bracelet, triple-folding buckle in 18K pink gold. Water resistant to 100 meters. 38mm black ceramic case, black ceramic and18K pink gold bezel, black dial with white diamond hour markers, automatic winding movement, black ceramic bracelet. 38mm 18K white gold and black high-tech ceramic case, ogival type screw-down crown, 18K white gold bezel set with 46 black high-tech ceramic baguettes (21 facets per baguette), highly scratch-resistant crystal, diamond dial with 84 baguette-cut diamonds (~ 2 carats) and 12 baguette-cut black high-tech ceramic indicators, self-winding movement with hours, minutes, seconds, approximately 42 hours of power reserve, black strap, ceramic bracelet, triple-folding buckle in 18K white gold. Water resistant to 100 meters. 38mm black ceramic case, stainless steel bezel set with 54 diamonds (~1.4 carat), black dial with white diamond hour markers, automatic winding movement, approximately 42 hours of power reserve black ceramic bracelet. Water resistant to 50 meters. 38mm 18K white gold and black high-tech ceramic case, 18K white gold bezel set with 34 baguette cut diamonds (approx. 2.54 carats), black dial with 12 baguette cut diamond indicators, self-winding movement with hours, minutes, seconds, approximately 42 hours of power reserve, ceramic bracelet, triple-folding buckle in 18K white gold. Water resistant to 50 metres. 38 mm black ceramic case, screw-down crown, steel bezel, black dial with numerals, self-winding movement with hours, minutes, seconds, approximately 42 hour of power reserve, ceramic and steel bracelet, triple-folding buckle. Water resistant to 200 meters.